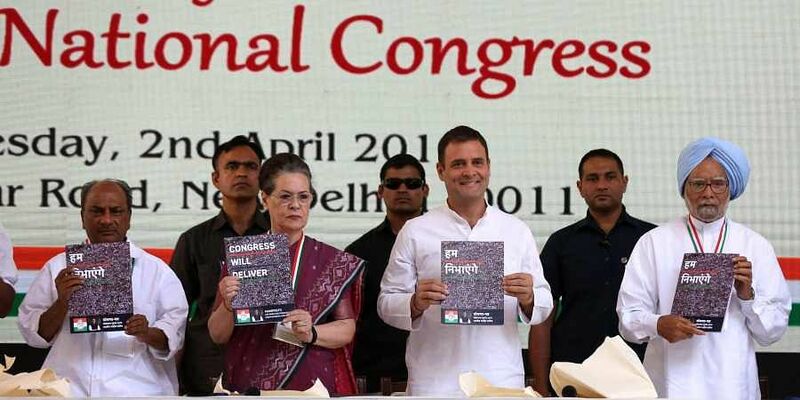 NEW DELHI: Amid growing rural distress, the Congress on Tuesday tried to reach out to the farming community in its poll manifesto, promising a separate Kisan budget, loan waiver and making failure to repay farm loan a civil offence instead of a criminal one. The 54-page manifesto aimed to merge wealth and welfare while keeping its focus on employment, growth and an economy that works for all. The party said it would not stop at the farm loan waiver but ensure freedom from debt through a series of policy measures. Releasing it along with other senior leaders, Congress president Rahul Gandhi said the Kisan budget would empower farmers to know what they are getting and where the money is being spent. “Farmers who are unable to return loans they take from banks will no more face criminal but only civil cases,” Rahul said. High on populism, the manifesto tried to bring back the narrative on issues like unemployment and poverty alleviation at a time when the BJP campaign has been focused around issues of national security and communalism. On the table are a series of welfare measures (see box) and increasing budgetary allocation for education and health sectors to 6 per cent and 3 per cent of the GDP, respectively. The party proposed to repeal or modify many of the key schemes of the BJP government like a modified taxation regime GST 2.0, electoral bonds, judicial reforms, restoring the autonomy of public institutions and scrapping NITI Aayog. Probing the Rafale jet deal and law to punish hate crimes were also promised. Experts saw in the manifesto’s economics a combination of good intentions to set right long-standing wrongs as well as proposals that could be too costly for the government’s strained revenues to bear. The GST rate structure is being sought to be tweaked from the current four to two. This could boost industry as goods taxed at 5 per cent would be zero-rated while retaining a standard rate of 18 per cent and a luxury goods tax rate of 28 per cent. “On paper, it’s a forward-looking promise,” said Sumit Dutt Majumder, former chairman, Central Board of Excise and Customs. The manifesto promises to raise farm produce prices while lowering input costs. Analysts say this may be sound economics if the produce fetches higher prices through increased exports and supplies to the food processing industry, but if it means raising food and fertiliser subsidies, it would simply add to the government’s strained fiscal balance.